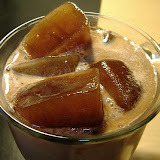 I am interested in making my own kahlua for Christmas gifts and entertaining at my home. I would like to know what is the best way to store it. Does it have to be stored in the fridge? Also, where can I buy some inexpensive bottles.